i once found a cast iron pan in a stove i took apart and sold it for 15$ didnt know cast iron pans were a hot item lol. 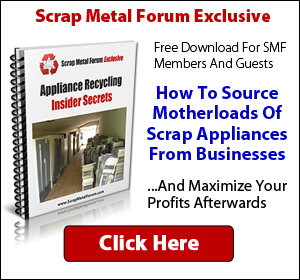 what have you guys found in scrap to resell? One time I found a cookie tin and inside of it was railroad spikes. I am making some railroad spike knives. Some years back I was loading up mixed tin from a remodeled furniture factory. In addition to other pieces, I loaded a couple dozen machine power drops; tin boxes about 10 feet long. I did not know until I got back to the shop, that each drop had 4 copper bars 1/2"x3/4" x 8' long. Needless to say, that load increased in value rather quickly! wow nothing like getting copper bars they are just like gold lol. change in a printer thats pretty cool to. only found change in a dryer and also in the dryer door. What's are some of your favorite things that you've found? Strange and random things found while scrapping.